Despite how it may feel, competition for the spiritual attention and Sunday attendance of today’s family is not with the growing church down the road. Church leadership must redirect energy from being “bigger and better” than other churches, and instead see those places that provide “WOW! Experiences” as the real points of comparison among first time guests. While that may seem like an impossible to achieve negative, this present reality can also be turned into a positive. Churches must start LEARNING from those top-notch places and their leaders. Eating out at one-of-a-kind experiences has never been more popular or accessible. Celebrity chefs and buzz-creating restaurants are literally popping up in cities across the country, large and small. 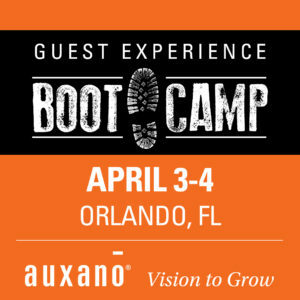 In the world of hospitality, the culinary segment has unique applications to the Guest Experience ministries of a church. 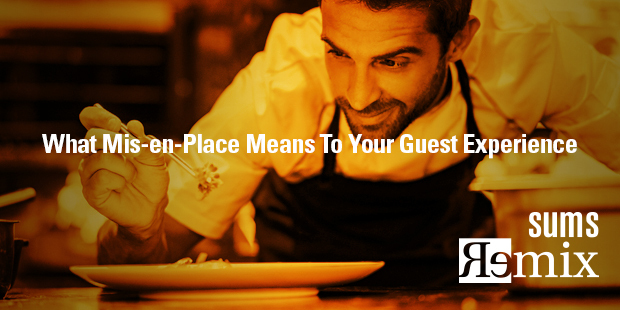 The dining experience at a four-star restaurant provides excellent lessons for EXCEPTIONAL welcoming ministries in your church. With recommendations from one son who is a general manager for a national restaurant chain and another who is the chef at a conference center, today’s post, along with two more to follow, explores the food industry. In it we will focus on a behind-the-scenes look at the importance of hospitality from some of the best restaurants in the country. Develop the art of mise-en-place. The first organizational book inspired by the culinary world, taking mise-en-place outside the kitchen. Every day, chefs across the globe churn out enormous amounts of high-quality work with efficiency using a system called mise-en-place―a French culinary term that means “putting in place” and signifies an entire lifestyle of readiness and engagement. In “Work Clean,” Dan Charnas reveals how to apply mise-en-place outside the kitchen, in any kind of work. Culled from dozens of interviews with culinary professionals and executives, including world-renowned chefs like Thomas Keller and Alfred Portale, this essential guide offers a simple system to focus your actions and accomplish your work. Charnas spells out the 10 major principles of mise-en-place for chefs and non chefs alike: (1) planning is prime; (2) arranging spaces and perfecting movements; (3) cleaning as you go; (4) making first moves; (5) finishing actions; (6) slowing down to speed up; (7) call and callback; (8) open ears and eyes; (9) inspect and correct; (10) total utilization. This journey into the world of chefs and cooks shows you how each principle works in the kitchen, office, home, and virtually any other setting. Every day, chefs across the globe put out enormous amounts of high quality work with efficiency using a system called mise-en-place – a French culinary term that means “putting in place” and signifies an entire lifestyle of readiness and engagement. For the culinary student, it is usually the beginning point of their career. But it is a beginning point that is repeated every day of their career – it’s the first thing they will do at the start of each day’s work. Mise-en-place means far more than simply assembling all the ingredients, pots and pans, plates, and serving pieces needed for a particular period. Mise-en-place is also a state of mind. Someone who has truly grasped the concept is able to keep many tasks in mind simultaneously, weighing and assigning each its proper value and priority. This assures that the chef has anticipated and prepared for every situation that could logically occur during a service period. Mise-en-place as a simple guide to focusing your actions and accomplishing your work is a necessary first step on the way to an exceptional guest experience. Mise-en-place comprises three central values: preparation, process, and presence. When practiced by great chefs, these three mundane words become profound. The byproduct of these values may be wealth or productivity, but the true goal is excellence. Chefs commit to a life where preparation is central, not an add-on or an afterthought. To become a chef is to accept the fact that you will always have to think ahead, and to be a chef means that thinking and preparation are as integral to the job as cooking. For the chef, cooking comes second. Cooking can’t happen without prep coming first. Embracing preparation also means jettisoning the notion that prep work is somehow menial, beneath us. Your preparation – and its intellectual cousin, planning – thus becomes a kind of spiritual practice: humble, tireless, and nonnegotiable. Preparation and planning along are not enough to create excellence. Chefs must also execute that prepared plan in an excellent way. S they ensure excellent execution by tenacious pursuit of the bet process to do just about everything. A commitment to process doesn’t mean following tedious procedures and guidelines for their own sake. It’s not about turning humans into hyper-efficient robots. Process is, quite the contrary, about becoming a high-functioning human being and being happier for it. Excellence arises from refining good process – how can I do this better or easier, or with less waste? It’s a job, like preparation, that never ends. Chefs commit to being present in ways from the mundane to the sublime. After months and years of repeated prep and process, the cook acquires a deeper kind of presence – becoming one with the work, and the work becoming kind of meditation. “Kitchen awareness” demands that one not only be “with” the work, but also “with” your comrades and their work at the same time. This kind of awareness isn’t scatteredness. It is, quite the contrary, something closer to what the Eastern traditions call mindfulness. Presence in all its forms – getting there, staying there, being focused, being open, and cultivating boundaries – helps us adjust our preparation and process as the circumstances shift around us. The three values listed above – preparation, process, and presence- aren’t ideals to admire and applaud. They must be practiced – and can be, by anyone, anywhere. 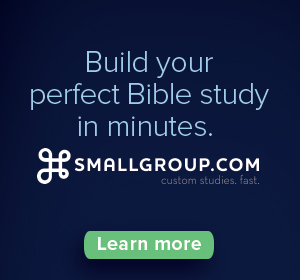 To apply the values listed above to your hospitality ministry, begin by creating three chart tablets, writing the values above, one word per page. Read the descriptions listed for each value. In a discussion with your team, walk through your guest experience from beginning to end, and list each action on the appropriate page. If it fits on more than one page, put it on the page it makes most sense, or is strongest. Review the lists with your team. What’s missing? Write it in, and assign it to a leader, along with a timeline, for development. What needs to be made stronger? Write it in, and assign it to a leader, along with a timeline, for strengthening. What’s unnecessary? Remove it from the list, and your regular activities. Excerpt taken from SUMS Remix 73-1, released August 2017. 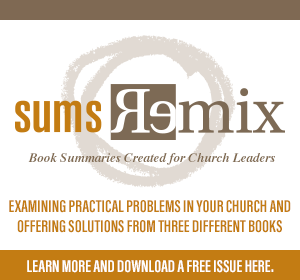 This is part of a weekly series posting excerpts from one of the most innovative content sources in the church world: SUMS Remix Book Summaries for church leaders.